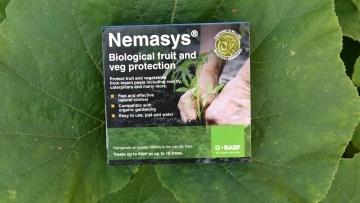 Nemasys® Biological Fruit and Veg Protection controls a broad range of pests including carrot and cabbage root ﬂy, cutworms, onion ﬂy, sciarid ﬂy, caterpillars, gooseberry sawﬂy, thrips, shore ﬂy and codling moth. Protect fruit and vegetables from insect pests including root ﬂy, caterpillars and many more. Nemasys® Biological Fruit and Veg Protection is a solution for all produce growing problems in just one product. It contains a mix of species of nematodes, which are naturally occurring microscopic worms that act as natural pest controls. Nemasys® Biological Fruit and Veg Protection can be used on home-grown produce with confidence, as it can simply be rinsed with water before eating. The specific method of application will vary depending upon which of the pests you are targeting. Application is recommended between April and October. Timings will vary depending upon location in the country and whether treating pests outside or undercover. 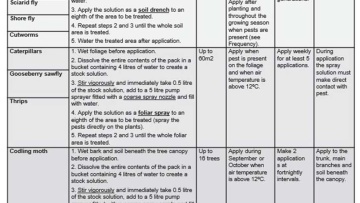 The frequency of application will depend on pest pressure. See product inner sleeve for further information.